Gather these step pieces from mold #96. 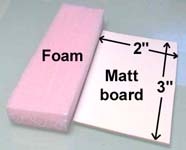 I'm using a piece of matt board with a 1/2" thick piece of foam board pushed next to it. Glue the floor tiles down onto each as shown. Glue the stair pieces onto the floor tiles. The center block is made using bricks from mold #291. 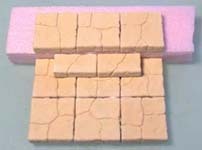 If you do not have this mold, simply glue two 1" square floor tiles back to back. Glue it in place and add the other wall blocks. Add the two remaining rows to this section to finish it. The purpose of the small brick section is to give the impression that this is a passageway that was blocked up at one time. 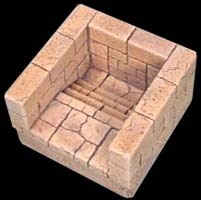 You can also break a few of these bricks to make it look like something has tried to break out recently. 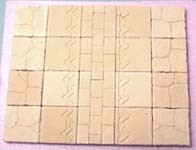 Collect the pieces shown here from mold #96 and mold #97. The only pieces needed from mold #97 is the sitting statue. 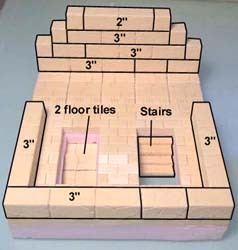 Glue the stair blocks onto a 1" x 1/2" floor tile. Glue the floor tiles shown down to a piece of foam. 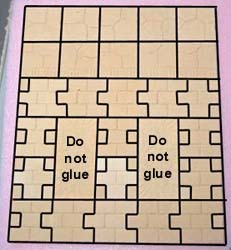 Do not glue down the large panels. Here I'm using tiles from mold #291. Remove the panels and cut holes in the foam slightly smaller than you need. That way the panels will have an edge to set on. You'll have to do a little extra cutting to get the stairs and floor tiles to fit down into the holes. Glue the remaining pieces shown and paint the panels and mummy separately. 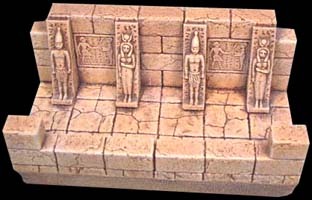 The slab on the left is broken before it's painted and the pieces are glued to make it look smashed in, revealing the mummy inside. The panel on the right has the vase glued on top so you can remove it and have access to the hidden stairway. 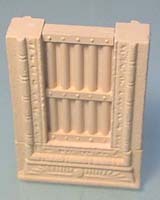 Gather these pieces from mold #97 for the modular door. 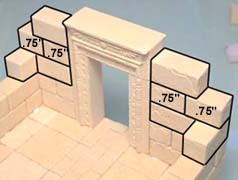 These blocks include two of the gate sections, one doorway top and two doorway sides. 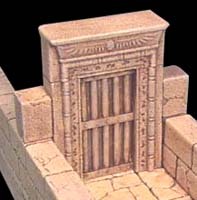 Sand down the insides of the two doorway sides (the scraped side of the blocks). 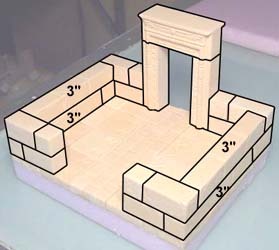 You want to do this so the doorway will easily fit into any hallway section. Glue the two gates back to back. 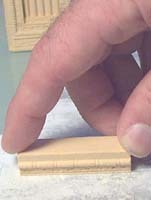 You may even want to sand the edges of these as well. Surround them with the doorway as shown. Be absolutely sure that the doorway will fit easily into any hallway section before you continue. You will notice that the decorative edging on the sides of the doorway may not line up quite as good since you've sanded the sides. Gluing the gate in the doorway is optional. Now you have a doorway you can put into any hallway section. Gather these pieces from mold #97. Glue the two halves of the gate together. 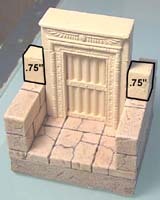 Since we want to open and close the gate, sand the edges so it fits loosely in the doorway. Glue a 4 x 5 grid of floor tiles down to a piece of foam. For this floor, I've used decorative tiles from mold #291 for the center and tiles from mold #292 for the rows on each side of center. 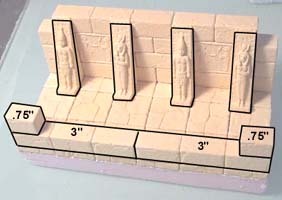 If you do not have these decorative molds, just use regular floor tiles instead. Glue the wall blocks and door frame down to the floor as shown. Glue the remaining wall blocks onto the back. Do not glue the statues into the room yet. These are fairly hard to paint around if you do. Paint the room and statues first, then glue them in afterwards. The door can be added or removed as needed. 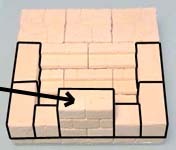 Glue the two halves of the decorative square blocks together. Glue together the wall section shown. Add the sloped buttresses onto the front. Glue together a 3 x 6 grid of floor tiles onto a piece of foam board. Glue the wall section you've made on top of the floor. 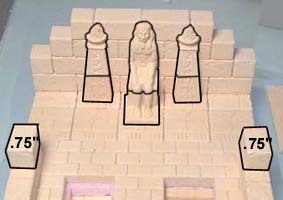 Glue the statues onto the buttresses and add the wall blocks onto the front.